Another dismissal! 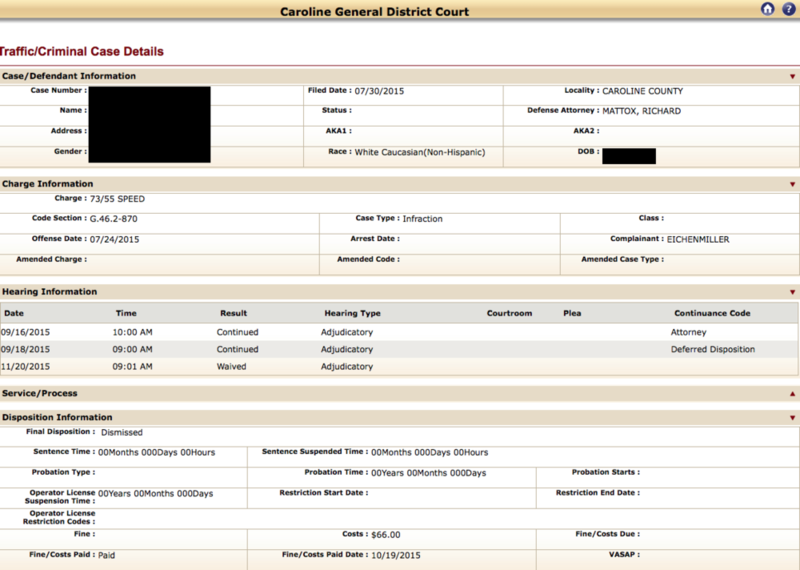 Trey Mattox was able to obtain a dismissal for client charged with reckless driving in Caroline General District Court. Trey Mattox was able to secure a reduction to a simple speeding infraction (79/70) for a client charged with reckless driving (99/70) in Caroline General District Court. This client was charged with reckless driving by speed for traveling 69 mph in a 35 mph zone. That is almost twice the speed limit! Trey was able to secure a dismissal upon the clients completion of an aggressive driving school. This kept any points from going onto our clients driving record and avoided the misdemeanor charge. Last week, in Caroline General District Court, Trey was able to successfully have this individual's reckless driving (96/70) charge reduced to a simple speeding infraction (79/70). A conviction of the original charge would have resulted in a fine of $515.00, a ninety (90) day license suspension, and a class 1 misdemeanor. Trey was able to have the court order our client to complete driving school and community service, in order to have the charge reduced. Trey was also able to further assist our client by convincing the court to grant our client an extension to meet all the requirements. Additionally, Trey worked to have the fine significantly reduced down to only $54.00. This month, Trey represented an individual charged with reckless driving for traveling 24 miles per hour over the posted speed limit, in Caroline County. A conviction would have resulted in a class 1 misdemeanor, license suspension, and a fine of at least $400. Due to the high speed, Trey recommended our client have the vehicle's speedometer calibrated and complete driving school before the court date. Trey, was able to achive an outcome resulting in a dismissal of the charge and the fine to be waived. In Caroline County, this individual was charged with reckless driving for traveling 79 miles per hour in a 55 mile per hour zone. A conviction would have added 6 points to his clean driving record. Those points would have stayed there for 11 years and severely impacted his insurance. Reckless driving is a criminal class 1 misdemeanor and a conviction would have negatively impacted his military career. We advised our client to have his vehicles speedometer calibrated and complete driving school. With a favorable calibration, military orders, a clean record, and completion of driving school, Trey was able to successfully have the charge dismissed with just $91.00 in court costs. Last week, Trey represented a client charged with reckless driving, for traveling 25 miles per hour over the speed limit. Trey was able to achieve an outcome resulting in the ourt choosing not to prosecute. She did not have to take driving school and the court costs and fines were waived. Recently, Trey represented one of our international clients charged with reckless driving for traveling 95mph in a 70mph zone. Trey, was able to present the case in such a manor the reckless driving was reduced to a simple speeding infraction. This saved our client from astronomical fines, increased insurance premiums, and avoided a license suspension. Recently, Trey represented a "repeat" client of ours in Caroline county charged with speeding (74/55). Despite this clients less than perfect driving record, Trey presented the case to the court and obtained a reduction to defective equipment, allowing our client to keep his Commercial Drivers License (CDL) and job. Another dismissal! Once again Trey was able to achieve an outcome resulting in a dismissal of our clients speeding charge for traveling 73mph in a 55mph zone. This week Trey represented a client who was charged with reckless driving for driving 23 mph over the speed limit. Trey was able to obtain a dismissal with only $91.00 in court cost. Last Friday, Trey was able to have a speeding charge 72/55 dismissed with only $66.00 in court cost. Last week, Trey was able to get an 85/70 reckless driving charge dismissed with only $91.00 in court cost! Recently in Caroline County, Trey was able to successfully achieve a favorable outcome for a client that received a reckless driving charge for driving 94 miles per hour in a 70 mile per hour zone. The client was facing a possible 60-day license suspension and a fine of $415.00 in addition to a class 1 misdemeanor on their criminal record. The reckless driving charge was reduced speeding (79/70) with no license suspension and a very small fine of $54.00 and court costs of $61.00. This week in Caroline, Virginia, Trey was able to have this clients reckless driving charge(80 miles per hour in a 55 mile per hour zone) dismissed with only court costs to pay, along with completion of an eight (8) hour defensive driving school. This not only kept a class 1 misdemeanor off of our client's criminal record, but also kept their driving record clean, as well. Today, in Caroline General District Court, Trey was able to obtain an outcome resulting in a reduction from reckless driving (91/70) to a speeding infraction (79/70). The original charge would typically carry a standard fine of $340.00 with a ninety (90) day license suspension. Our client now only has to pay a small fine and court costs and will not have their license suspended. Recently in Caroline County, Trey was able to have a client's speeding ticket totally dismissed. They were charged with going 74 miles per hour in a 55 mile per hour zone. The client only had to complete an 8-hour defensive driving school and pay a small court costs. Last week in Caroline General District Court, Trey was able to have a client's reckless driving charge totally dismissed. This kept the client from having a class 1 misdemeanor conviction on their record, which was important to them since he works at a high school. The dismissal also prevented a license suspension and fine to pay. Trey was able to obtain a great result in Caroline General District Court today. The client had received a speeding ticket for driving 74 miles per hour in a 55 miles per hour zone. Trey was able to have the entire case dismissed without a fine and/or court costs. This dismissal kept the client's driving record clean as well as preventing an increase of their insurance rate. Trey recently resolved a case for a client charged with speeding, 54 miles per hour in a 35 mile per hour zone. The client is a current Commercial Drivers License (CDL) holder, which makes him ineligible for court ordered driving school. Trey was able to have the speeding charge reduced to a non-moving violation called defective equipment. This result prevented the client from getting any points on their driving record, which was very important to them as driving commercial vehicles is his main source of income.